Tune in or tune out: How does Windows 8 stack up on a home theater PC? Just in time for the Windows 8.1 coming out party, Microsoft released its own remote desktop client for Android and iOS devices. The free download lets anyone who’s enabled remote desktop functionality on their Windows PC (Pro versions only) connect to their desktop from afar. That’s the theory, anyway. In my hands-on time with the app on a Nexus 7 and a Nexus 4, I concluded that most users needing remote desktop access are better off with simpler third-party options. To use remote desktop, you must configure the settings in your Control Panel to allow remote connections. Microsoft has a straightforward tutorial on how to set up your PC to accept remote desktop connections. Once that’s done, you can find the Android and iOS apps on Google Play and iTunes. Both apps work on either smartphones or tablets. 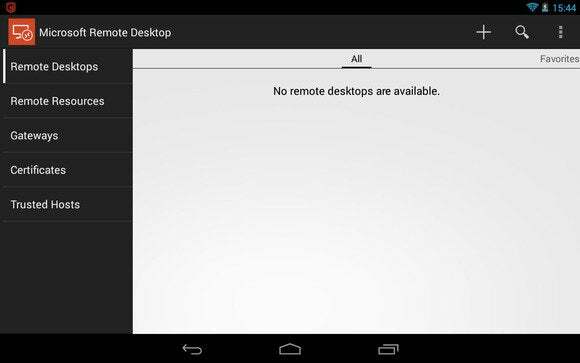 This is what you’ll see when you open Microsoft Remote Desktop on Android. At first glance, the login details for setting up a remote desktop connection look pretty straightforward. First, enter your computer’s local IP address, which you can find by running the “ipconfig” command from the command prompt. Then enter your account name and password in the credentials section, and you’re done. As long as your Windows firewall isn’t plugging things up, you should be able to connect to your PC. In my tests, however, the app wasn’t so simple that you could just set it and forget it. In fact, I couldn’t get it to connect at all despite numerous troubleshooting attempts. If you’re the only IT resource at home, and you don’t have much experience with Microsoft’s remote desktop, you might be better off with some of the simpler third-party options available, such as Splashtop 2. Splashtop 2 offers a simpler option than Microsoft’s new remote client. It took me just two minutes to set things up on a Nexus 7. It’s also a shame that Microsoft removed its no-nonsense SkyDrive remote file access from Windows 8.1. It was a handy feature for those times you needed to grab a few files you forgot on your desktop. If you’re looking for a DIY remote access solution, we recently looked at five free remote desktop options that are worth considering. These apps don’t require you to be running a Pro version of Windows to access your PC from afar and only take minutes to set-up.